Hours after the House Republicans passed a tax bill Thursday, the Senate Finance Committee approved their tax bill, pushing it closer to a full vote on the Senate floor. The Finance Committee approved the bill along party line 14-12, with not one Democrat voting for it. Like the House measure, it would slash the corporate tax rate and reduce personal income tax rates for many. Senate Majority Leader Mitch McConnell said earlier this week that he plans to bring the bill to the Senate floor after the Thanksgiving recess. The Senate adjourned Thursday night for Thanksgiving and will reconvene on Monday, Nov. 27. But it remains unclear if Republicans have the votes for it to pass. What does the GOP tax plan mean for Americans? The Senate package adds a key feature not in the House version: repeal of the Affordable Care Act's requirement that everyone in the U.S. have health insurance. Elimination of the so-called individual mandate would add an estimated $338 billion in revenue over 10 years that the Senate tax-writers used for other tax cuts. The Senate panel's vote came at the end of four days of often fierce partisan debate. 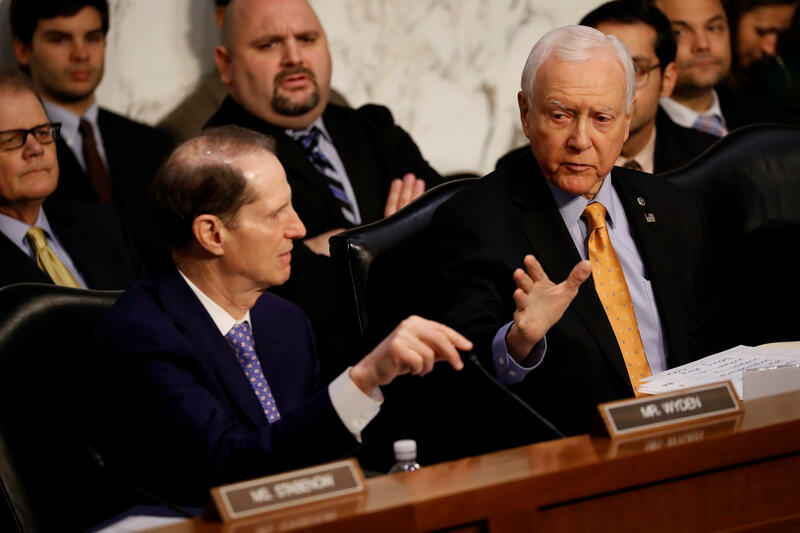 It turned angrily personal for Chairman Sen. Orrin Hatch (R-Utah) as he railed against Democrats' accusations that the legislation was crafted to favor big corporations and the wealthy. "I come from the poor people. And I've been working my whole stinking career for people who don't have a chance," Hatch insisted. After the panel's approval, McConnell declared, "For the millions of hard-working Americans who need more money in their pockets and the chance of a better future, help is on the way." The analysts' problematic projections for the Senate bill came a day after Wisconsin Sen. Ron Johnson became the first GOP senator to state opposition to the measure, saying it didn't cut levies enough for millions of partnerships and corporations. With at least five other Republican senators yet to declare support, the bill's fate is far from certain in a chamber the GOP controls by just 52-48. Even so, Republicans are hoping to send a compromise bill for President Trump to sign by Christmas. After the House vote, Vice President Pence remarked"Now the ball is in the Senate's court." Speaking at a conservative Tax Foundation dinner in Washington, Pence said, "The next few weeks are going to be vitally important and they're going to be a challenge." But he added, "we're going to get it done" before the end of the year. An earlier White House statement that "now is the time to deliver" also underscored the Republican Party's effort to maintain momentum and outrace critics. Those include the AARP lobby for older people, major medical organizations, Realtors - and, in all likelihood, every Senate Democrat. With this summer's crash of the GOP effort to dismantle President Barack Obama's health care law, Republicans see a successful tax effort as the best way to avert major losses in next year's congressional elections. House Republicans conceded they are watching the Senate warily. "Political survival depends on us doing this," said Rep. Kevin Cramer, R-N.D. "One of the things that scares me a little bit is that they're going to screw up the bill to the point we can't pass it." The House plan and the Senate Finance bill would deliver the bulk of their tax reductions to businesses. As decades of Republicans have done before them, GOP lawmakers touted their tax cuts as a boon to families across all income lines and a boost for businesses, jobs and the entire country. "Passing this bill is the single biggest thing we can do to grow the economy, to restore opportunity and help those middle income families who are struggling," said House Speaker Paul Ryan of Wisconsin. The bill is "pillaging the middle class to pad the pockets of the wealthiest and hand tax breaks to corporations shipping jobs out of America," declared House Minority Leader Nancy Pelosi of California. Thirteen House Republicans - all but one from high-tax California, New York and New Jersey - voted "no" because the plan would erase tax deductions for state and local income and sales taxes and limit property tax deductions to $10,000. Defectors included House Appropriations Committee Chairman Rodney Frelinghuysen, R-N.J., who said the measure would "hurt New Jersey families." Congress' Joint Committee on Taxation estimated that the Senate plan would mean higher taxes beginning in 2021 for many families earning under $30,000 annually. By 2027, families making less than $75,000 would face tax boosts while those making more would enjoy cuts. One would end the measure's personal tax cuts starting in 2026. The other would abolish the "Obamacare" requirement that people buy health coverage or pay tax penalties. Ending the personal tax cuts for individuals in 2026, derided as a gimmick by Democrats, is designed to pare the bill's long-term costs to the Treasury. Legislation cannot boost budget deficits after 10 years if it is to qualify for Senate procedures that bar bill-killing filibusters. Both chambers' bills would nearly double the standard deduction to around $12,000 for individuals and about $24,000 for married couples and dramatically boost the current $1,000 per-child tax credit. But each plan also would erase the current $4,050 personal exemption and annul or reduce other tax breaks. The House would limit interest deductions to future home mortgages of up to $500,000, down from today's $1 million, while the Senate would end deductions like moving expenses and tax preparation. Ryan said he'd seek to add tax breaks to help Puerto Rico recover from recent hurricanes to a House-Senate compromise.